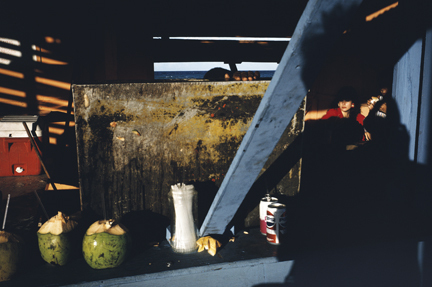 Alex Webb, Pinones, Puerto Rico, 1990, from the book "The Suffering of Light"
Sailing in the Caribbean, I catch a mahi mahi. It takes two men to lift its four-foot body from the sea. On the hot teak deck, I watch the creature shift its tint, from teal to indigo to aquamarine, like having a tiny sea, beautiful and raging, at my bare feet. As it flips and flops, I feel a little afraid of this great hulking dying thing. I wish it would fly. I wish it would be still. I’m ashamed how hungry it makes me feel. You are currently browsing the archives for the Correspondences category.